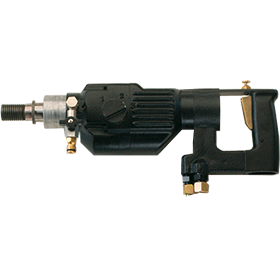 The CD10 and CD12 hydraulic core drills are ideal for drilling concrete, masonry and asphalt materials. Both Stanley models have a three-speed gearbox providing speed selection to properly match the drill bit. 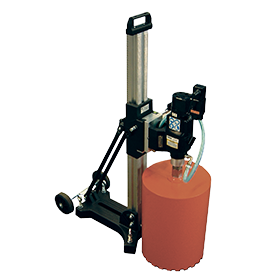 The CD10 can be operated freehand or mounted in an optional drill stand. The CD12 is operated from a furnished drill stand that is adjustable at any angle to drill holes from 45 degrees to perpandicular. Perfect for all your construction and demolition tool needs. 5.8-13 gpm (22-50 lpm) operating range. 3 speeds, 380, 900, and 1800 rpm. Gardena quick connect water connection coupler. Drilling aid for freehand drilling assistance. 1/2 x 5/8-11 in. thread adapter included. 4-6 gpm (15-23 lpm) operating range. Anchor stand, adjustable from 90° to 45°. 1-1/4 UNC male, 1/2 UNC female spindle connection.